specificalHuman PGE2 ELISA Kit is based on the competitive binding enzyme immunoassay technique. The microtiter plate provided in th is kit has been pre-coated with an antibody specific to PGE2 , During the reaction,PGE2 in the sample or standard competes with a fixed amount of biotin-labeled PGE2 for sites on a pre-coated Monoclonal antibody specific to PGE2 . Excess conjugate and unbound sample or standard are washed from the plate. Next, Avidin conjugated to Horseradish Peroxidase (HRP) is added to each microplate well and incubated. Then a TMB substrate solution is added to each well. The enzyme-substrate reaction is terminated by the addition of a sulphuric acid solution and the color change is measured spectrophotometrically at a wavelength of 450 nm ± 2 nm. The concentration of PGE2 in the samples is then determined by comparing the O.D. 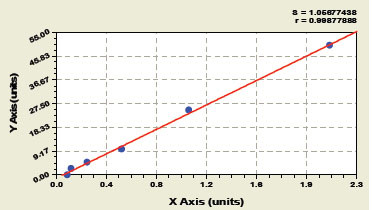 of the samples to the standard curve.